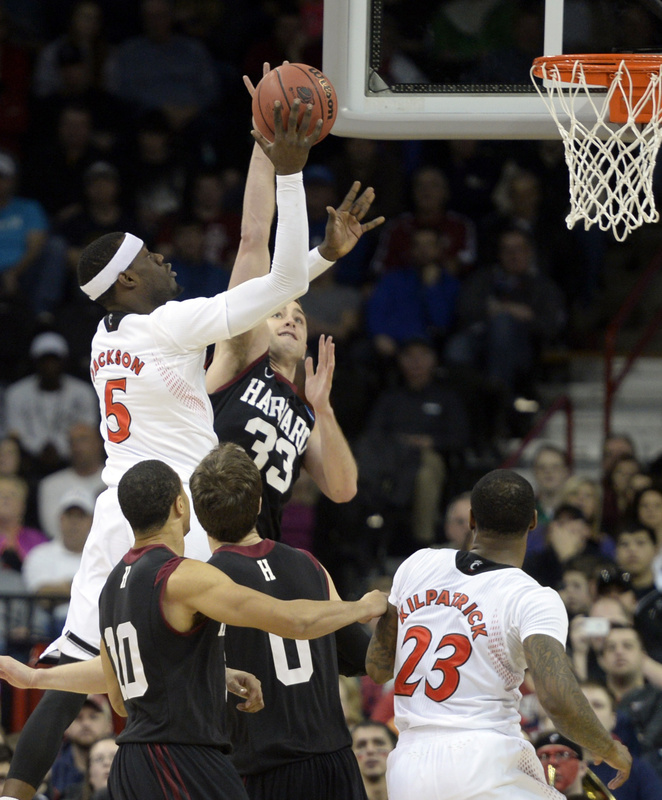 Harvard had every reason to be a casualty in the NCAA tournament at the Arena on Thursday afternoon. Facing fourth-seeded and 15th-ranked Cincinnati, the Crimson couldn’t make a free throw and could barely run a set offense. Heck, they could barely get the ball inbounds. But when it counted most, 12th-seeded Harvard made all the plays and pulled off a 61-57 surprise, advancing to the third round against Michigan State. That after he watched his team go 17 for 28 from the free-throw line, commit 12 ugly turnovers and shoot 35 percent in the second half. But it’s survive and advance and the Crimson (27-4) are moving on because they matched the physical play and athleticism of the Bearcats (27-7) and kept their composure down the stretch. Siyani Chambers hit a pull-up jumper at the foul line with 1:58 left after Cincinnati pulled within 54-53. And when the Bearcats were within two, Chambers and Wesley Saunders made two free throws each in the final 25 seconds. “Coach always talks about if we do what we’re supposed to do, stick to the game plan, we expect ourselves to win,” Chambers said. A big part of that was an efficient offense in the first half – 50 percent shooting on 6 of 11 3-pointers to offset 6 of 11 free throws and eight turnovers for a 36-29 lead. And a great defensive effort in the second that limited Cincinnati star Sean Kilpatrick to four shots for a hard-earned 18 points. Cincinnati shot 36.8 percent, missing countless shots at the rim, and only had one more rebound. Justin Jackson had 13 points and 11 rebounds for Cincinnati but only made 5 of 15 shots around the rim. Wesley Saunders, who led the defensive charge against Kilpatrick, led Harvard with 12 points, Chambers and Laurent Rivard, who was 3 for 3 behind the arc in the first half, had 11.